Discacciati 5012con adjustable concert piano stool from just-piano-stools.co.uk, Italian made Discacciati adjustable concert piano stool. Just Piano Stools for the widest choice of quality piano stools. UK postage is included in the price. These Discacciati concert piano stools are available to order. Please allow up to six weeks for delivery. The Discacciati 5012con solo adjustable concert piano stool with empire style legs. Available in satin or gloss finish in a selection of wood colours. The seat is only available in black leather. 57cm wide, 38cm deep and 47cm to 57cm high. Sorry we no longer supply Discacciati stools. The Discacciati company has been a family business for three generations and was originally established in 1890. The factory is located in Barlassina in Italy. The high standard of quality and craftsmenship bring you a range of piano stools that will grace any antique, traditional or modern piano. These piano stools are manufactured by Discacciati and are made to order. Please allow six weeks for delivery of your new piano stool. 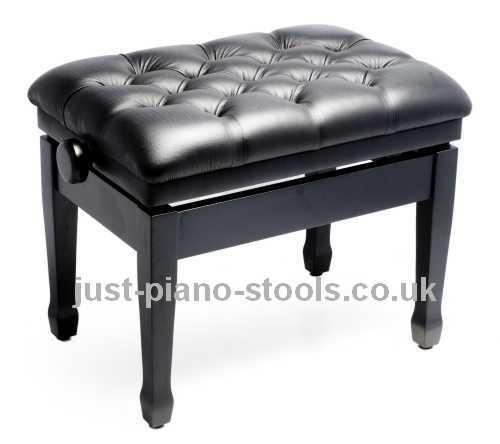 See the full range of Tozer piano stools. Available with a choice of styles, fabrics and wood colours. Woodhouse offer a huge range of piano stools, all available in selection of wood and fabric options.